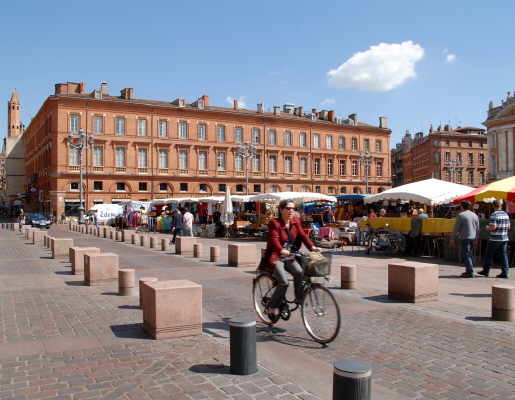 Nicknamed the ‘Pink City’ because of the preponderance of red-brick buildings, Toulouse, the fourth largest conglomeration in France, is a mildly frenetic, hugely entertaining and vibrant place. Any thoughts of a sycophantic city paying homage to Paris or Lyon are soon dispelled; Toulouse, capital of France’s largest region (Midi-Pyrénées) very much has its own identity, a glorious tangle of narrow streets and squares, buildings great and small, intimate nooks and crannies. 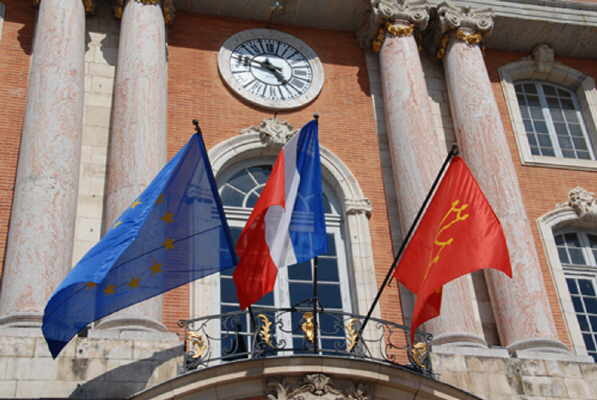 Within site of the Pyrenees, Toulouse is not surprisingly subject to influences from Spain, culturally, gastronomically and architecturally, although it retains and cultivates its own Occitan identity – street names, for example, are bilingual. The result is a keen, energetic and cosmopolitan setting made all the more spontaneous by the third largest student population (over 100,000 of them) in France. Toulouse is built on the alluvium of the Garonne, at a point were the river bend accumulated silt over a long enough period for it to become sufficiently stable to build on. The present-day banks of the Garonne have been developed to enable people to flâner along the quays from Place Saint-Pierre to the Quai de Tournis, very much in the manner of the French. But the Garonne is not the city’s only waterway: the Canal du Midi, which links the Med and the Atlantic, also finds a way through the city. Designed by Béziers-born Pierre-Paul Riquet – who lies entombed beneath a modest slab in that rather persuasive and endearing architectural pile up that is the cathedral of St Étienne – the canal, an engineering masterpiece, is today classified as a World Heritage Site. Built under Louis XIV, it is the oldest operational canal in Europe, and offers a chance to see the city from a boat tour, or to use its banks for cycling or walking. Strolling, preferably aimlessly, is by far the best way to see the city, especially the charming area of narrow streets (ruelles intimes) in the St Etienne district around the Place des Carmes. Pedestrianisation of the city centre has come on apace in recent years, but you can opt to hop on the free shuttle service, the Tisséo, if you want to explore the city centre less demandingly. One thing does become quickly apparent about Toulouse: it may be a major city but its centre has the genial intimacy of a quart in a pint pot! The heart of the city lies around the Capitole, an impressive and ornate building, wherein the popular but luckless Duke of Montmorency was privately beheaded. 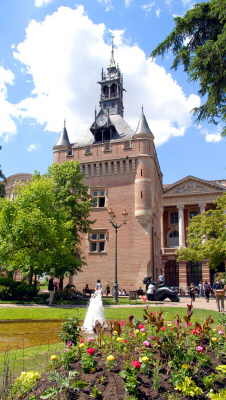 The interior of the building hosts magnificent murals and scenes that depict the history of Toulouse. Outside, the huge Place du Capitole, is often given over to multi-ethnic markets, its arcaded perimeter accommodating the ubiquitous shops, bars and street cafés. Secular visitors may shun the most obvious of religious buildings, but Les Jacobins, where the Dominican Order was founded in response to the threat posed by the Cathar legacy, is worthy of a visit not least because of its unique two-part construction and the almost insignificant altar beneath which lie the relics of the ancient doctor, St Thomas Aquinas. The great nave, its mirrored reflection of the ornate ceiling and the play of sunlight through the stained glass windows is especially delightful, as, too, are the peaceful cloisters, and adjacent chapel which is host each year to recitals of classical music. Music features large in the annual repertoire of life in Toulouse, not least in June when the city hosts the Rio Loco Festival, a week-long extravaganza that focuses on the music of one particular country: in 2007 it was Spain, in 2008, the Balkans. 2009 will bring the musicians of North Africa to the Prairie des Filtres on the Garonne riverside. Gardens, like the Prairie des Filtres are very much a theme of Toulouse, none more so than the spectacular Jardin Royal in the Grand-Rond district, the first public garden in Toulouse, and quite in the English style complete with bandstand. Footbridges link the garden to the Jardin des Plantes, built to house the botanical collection of the Academy of Science, and now adjoining the very modernistic and excellent Museum of Natural History, re-opened in 2008 after a closure of ten years. The end result is as tasteful as any museum can be; a well-thought-out enterprise of diligence and perseverance. 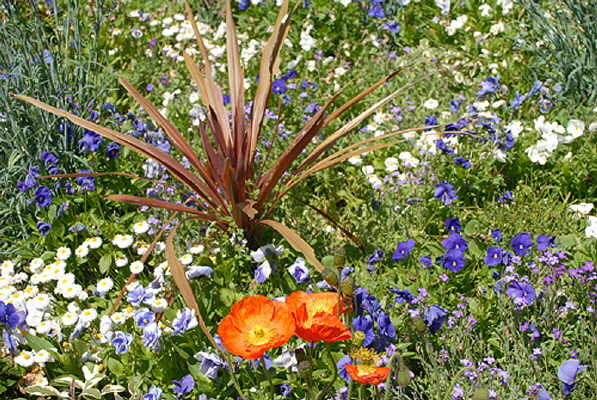 Flora also appears in Toulouse in the most unexpected of guises. The symbol of Toulouse is the violet, thought to have been brought to the city in the 19th century by soldiers returning from the Napoleonic Wars. Today, this link and the significance of the flower is perpetuated in La Maison de la Violette, a 1930’s canal barge formerly used to transport wheat and fuel, but today publicising the many uses and intrigues of the violet in an innovative way. 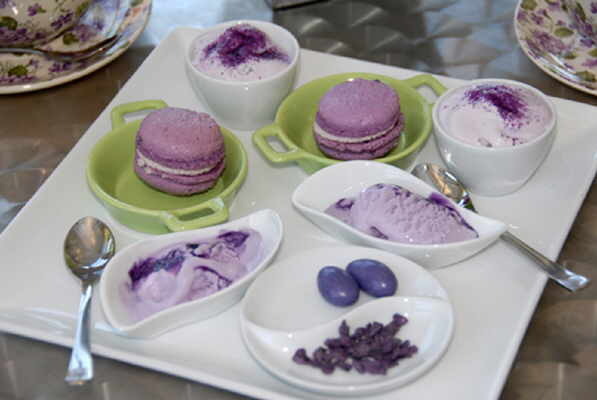 The experience is rendered all the more agreeable by the addition of a roof-top Salon de Thé, where, as the city goes by, you can enjoy violet infusions, purple macaroons and sugared almonds, even violet ice cream. 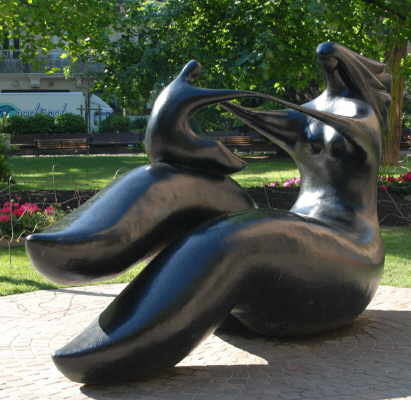 Toulouse has the power of seduction, a place that captivates on first acquaintance. But it is anything but trivial, and within its embrace lies a fascinating history exemplified by superb Renaissance buildings, like the Hotel d’Assézat, emblematic of the place woad has played in the city’s history, and built in 1555. Today, this grand hotel particulière houses the Bemberg Foundation, a supreme collection of artwork by Cézanne, Picasso, Tintoretto, Manet and others. 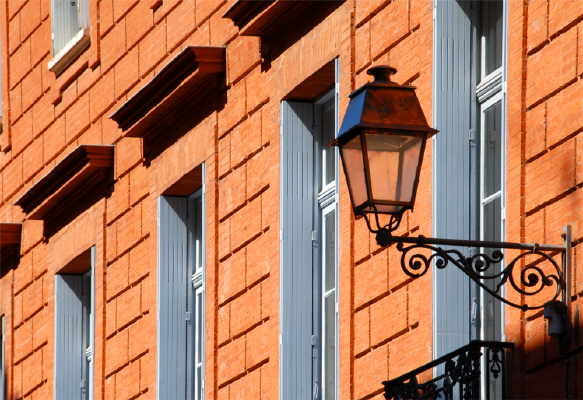 Yet bolted onto this outstanding heritage, Toulouse is very much a city of the present and the future. The city has a deep-rooted cultural identity, but accommodates this alongside its desire to be forward-looking and enterprising. The launch of the Airbus A380, the largest aircraft in the world, has made Toulouse the European capital of aeronautics. And, if flight in all its forms is your interest, then the Cité de l’Espace on the outer ring road, is a unique concept, and the sort of inter-planetary experience wherein children might never know you had gone as you slip back into town for lunch (not that you have to, of course). And if the Cité de l’Espace lies along the way to the stars, then the city of Toulouse rests on another pilgrims’ route, that to Compostela. Indeed, the Hotel Dieu on the left bank of the Garonne, close by Pont Neuf, was used as a hospice for 800 years, and stood as a major site on the pilgrims’ route. In the past, the building received the country’s down-and-outs, beggars, vagabonds and loose women, but today it is a World Heritage Site housing the administrative centre of a teaching hospital and museum of medicine. Culture has always been at the heart of Toulouse, and the city has one of the most extensive and intense cultural calendars. When the new Barrière Casino-Theatre opened in 2007, as well as the customary ‘casino’ enterprises, it included a 1,200-seat multi-functional auditorium, three bars, and three restaurants, including the exquisite, La Fouquet, which reinforces the great traditions of French cuisine and attention to detail. It is plain to see why Toulouse is such a persuasive city, but should vision fail, then tour the city at night to enjoy the Plan Lumière, when a remarkable system of lighting picks out thousands of architectural details, bringing even the night-time scenes of Toulouse very much to life. Toulouse has regular flights from Paris, and with British Airways, easyJet and Jet2.com from UK London and some regional airports. A shuttle links the airport to the city centre, although plans are in process to develop a tramway link to the airport (Blagnac). Direct TGV from Paris (5h30) and Lille (7h30). 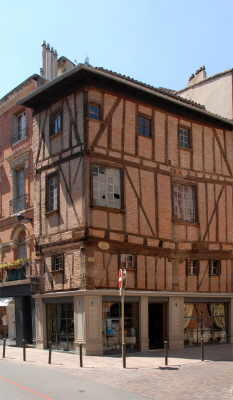 Restaurant Coq Hardi, 6 rue Jules Chalande, 31000 Toulouse. Tel: 05 61 21 61 01. Advance notice that Rio Loco is inviting South AFrica with more than 300 artists, including Johnny Clegg as a guest star. From April 2010 (until 2012), the Cité de l’espace theme park is celebrating “Searching life in the Universe – Aliens ? !” with great interactive areas of exhibition, experimentation, IMAX and planetarium shows. Check out the brand new video promoting “La vie à Toulouse”. It’s like a singing portrait. …I forgot – Coq Hardi is in a quiet street near the centre of the city, has limited space, but has an excellent menu. I only recommend restaurants I have visited and tried. Both these restaurants are exceptional – En Mage is small but recently was awarded its first Michelin star. The Fouget Restaurant is in the Casino, but independent from it, and again serves outstanding cuisine. En Mage is relatively quiet; Fouqet, with its greater size, is somewhat more boisterous, in a restrained kind of way. Is there any reason why the author makes specific restuarant recommendations? Price? Quality? Location? Entertainment? I am trying to plan a company visit and could do with knowing.